ORIGINAL TRAVEL POSTER NEW ZEALAND 1966 RARE. VERY HARD TO FIND TRAVEL POSTER TO NEW ZEALAND PRODUCE BY R.
POSTER IS IN VERY GOOD CONDITION. THE ARTWORK IS STYLISTICALLY IN THE VEIN OF AUSTRALASIAN POSTER ART OF THE TIME. NOTABLY NAC AIRLINE AND TEAL AIRWAYS POSTERS. NEW ZEALAND COUSINS OF QANTAS AIRLINES. POSTER SHOWS GREAT ARTWORK OF LOCAL SITES IN THE FORM OF STAMPS. POSTER MEASURES A LARGE 40 X 25 INCHES. THIS POSTER HAS APPEARED IN MANY OF THE BOOKS AVAILABLE ON NEW ZEALAND POSTERS. NEARLY IMPOSSIBLE TO FIND AS NOT MANY WERE PRINTED. 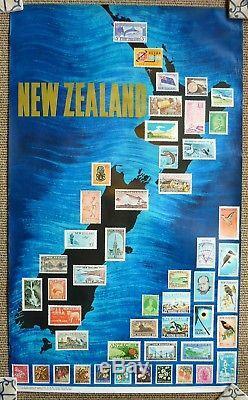 The item "ORIGINAL TRAVEL POSTER NEW ZEALAND 1966 RARE" is in sale since Friday, November 16, 2018. This item is in the category "Art\Art Posters". The seller is "mediagram" and is located in Palmerston North. This item can be shipped worldwide.